The Junction has a history unlike any other Toronto neighbourhood. 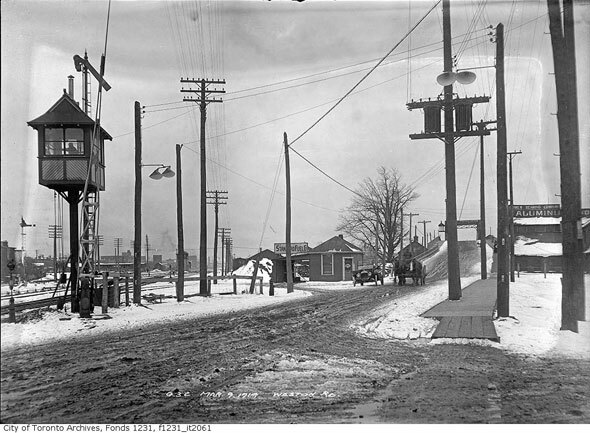 Growing up near the crossroads of two ancient portage trails, the hardscrabble, boom-and-bust Town of West Toronto Junction was given life in the late 1800s by four major railway lines and numerous mills, factories, and other heavy industries located within its boundaries. The Junction, briefly the independent City of West Toronto, was annexed in 1909, five years after the town declared itself alcohol free. Remarkably, the prohibition of alcohol within the neighbourhood persisted until 1997, around the time gentrification began to take hold. Today, condos are sprouting inside former factories, but there are still pockets where manual labour persists. Here are 10 quirky things to know about the Junction. Indian Road follows the route of a First Nations portage trail that lead north from the Humber Bay. At Davenport Rd., the trail met another popular path that followed the ancient Lake Iroquois escarpment east-west. 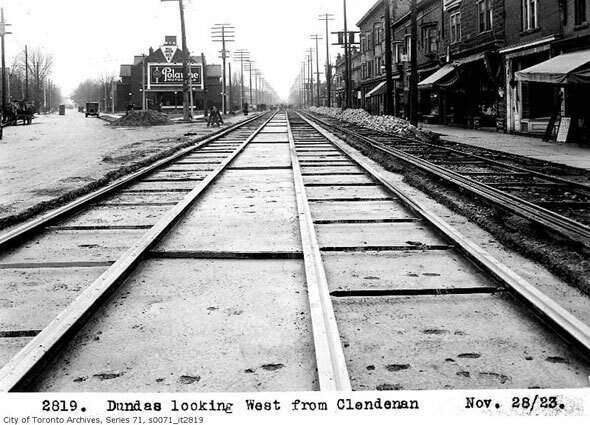 The original junction, the intersection of the trails, was therefore probably located close to present day St. Clair and Keele. James Ellis was a prolific architect. Between 1889 and 1912, he designed a variety of buildings in Ontario, but the majority of his work--houses, a school, church, library, and firehall--is in the Junction. Ellis was also a resident of the Junction, so he no doubt used the buildings he designed on a regular basis. Today, at least 50 of his buildings still stand. The days of the famous rail intersection that gave the Junction its name are numbered. For decades, two busy rail corridors met at almost 90 degrees: no tunnel, no bridge, just a simple crossover. The interchange required a complex set of lights and switches to keep safe and for a time there was an elevated control box that oversaw rail traffic through the potentially dangerous area. Metrolinx is currently in the process of building a tunnel under the old junction in an effort to speed up commuter service through the area. Early Junction-area landowner William Keele (yes, that Keele) built the Carlton Park Race Course on his sprawling property southwest of Dundas and Keele in 1857. The oval track, if it still existed, would have run north-south from roughly Annette to Glenlake, parallel to Keele. The first Queens Plate was run at Carlton Park in 1860, but the course closed permanently in 1882. Before 1904, the people of the Junction were free to drink in any of the town's taverns, and they do so heartily. When the community decided to go dry that year, it was an attempt to curb the uglier side of the alcohol industry, namely fighting and public drunkenness. Toronto was notoriously Victorian about drinking in the early 20th century, so the ban wasn't a total shock. What's remarkable is that the prohibition managed to survive until 1997. Like Riverdale, Parkdale, Brockton, and other Toronto neighbourhoods, the Junction used to be an independent town before it was swallowed by the growing metropolis to its east. Unlike the others, however, the Town of Toronto Junction remained doggedly independent to the last. It claimed city status in 1908 and briefly challenged Toronto for rail supremely. The independent spirit persisted after it was annexed: the neighbourhood clung to its dry law for almost a century. The Magna Carta--the "Great Charter"--was issued in 1215 by King John of England in an attempt to calm a political crisis. The document, sealed with wax at Runnymede, a meadow beside the Thames near Old Windsor, is considered a cornerstone of the British constitution, even if the majority of its clauses were later deleted. However, the Magna Carter's declaration that all free men had the right to justice and a fair trial is repeated in the United States Bill of Rights, Universal Declaration of Human Rights, and the European Convention on Human Rights, writes the British Library. J. Turner Sr., a west end builder, loved terracotta. The decorative tile was popular until around the mid 1890s, when it began to fall out of fashion as an exterior cladding. Turner, however, loved the stuff. He covered his Jerome St. home in the stuff leaving almost no spaces. Never mind that much of the tile he used was manufactured for use on larger buildings. The Union Stock Yards used to dominate the southwest corner of St. Clair and Keele. From 1903 up to the mid 1980s, the massive site was home to packing houses, abattoirs, and animal storage areas. During the first world war, the site was taken over for military use and later fell under the ownership of the province. 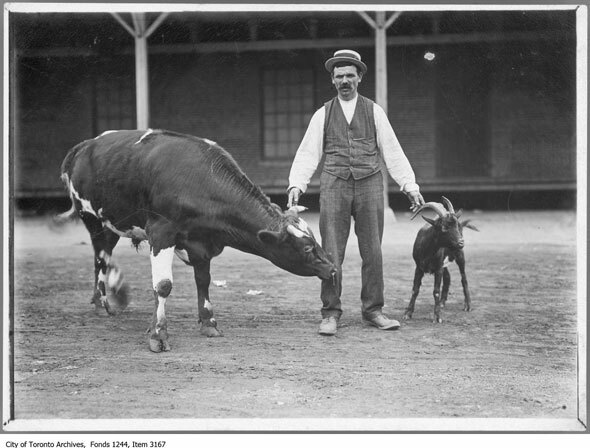 The Ontario Stockyards continued into the 1980s, when the rail companies began to stop carrying animals. Between 1995 and 1999, the site was gradually demolished and sold off. The Junction of today is smaller than it used to be. Before annexation, the town extended as far south as Bloor and northern High Park. Maps from 1903 show everything between Bloor and St. Clair between the Humber River and Keele as being part of the Junction, about four times as much space as the current neighbourhood boundaries allow.